Croydon Vision is looking for a new Trustee to join the Board. We are particularly looking for someone with skills and knowledge in Business Development and Fundraising. To assist the Board of Trustees and Executive Director with expertise in business development, corporate sponsorship and other funding initiatives. Offering oversight and guidance as the organisation continues to diversify income streams. Experience of diverse fundraising practices, including statutory funds, corporate and philanthropic giving would be valuable. An understanding of Corporate Social Responsibility and how impactful corporate-charity relationships are built. Strategic vision, analytical and evaluation skills, demonstrating good judgement. To assist in the strategic development of a growing organisation. To advise on the development of partnerships within the business community leading to Corporate Social Responsibilities’ or other support e.g. corporate sponsorship. To link with businesses and organisations and develop working partnerships that may lead to increased sustainability. To provide thought leadership around issues of business development and sustainability. Contributing knowledge of fundraising techniques and strategies, understanding results and budgets with real insight. 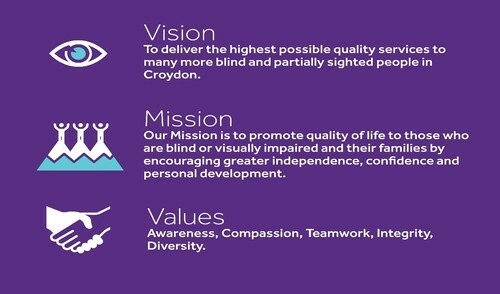 To apply, please email HR@croydonvision.org.uk your CV along with a covering letter of 250-300 words; stating why you wish to join the organisation, how your skills would add value to the board and any other relevant information.